Terroir: Zebo Moscato is sourced from family owned vineyards in Sicily’s Marsala and Pantelleria regions. Vines are planted on southeast facing slopes and average 20 to 30 years old. Harvest takes place in early September. Vinification: Upon arrival at the winery the Moscato grapes receive a soft pressing followed by fermentation under pressure in temperature controlled stainless steel vats. The young wine is cooled when desired sugar and alcohol levels are reached and fermentation is stopped. Bottling takes place after a short rest in tank. 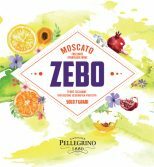 Zebo Moscato is an extremely refreshing lightly sparkling wine with notes of fresh nectarine, melon and white peach. Delicate, slightly sweet with a long lingering finish.